MOGADISHU, Somalia — Awil Salah Osman prowls the streets of this shattered city, looking like so many other boys, with ripped-up clothes, thin limbs and eyes eager for attention and affection. But Awil is different in two notable ways: he is shouldering a fully automatic, fully loaded Kalashnikov assault rifle; and he is working for a military that is substantially armed and financed by the United States. “You!” he shouts at a driver trying to sneak past his checkpoint, his cherubic face turning violently angry. The driver halts immediately. In Somalia, lives are lost quickly, and few want to take their chances with a moody 12-year-old. It is well known that Somalia’s radical Islamist insurgents are plucking children off soccer fields and turning them into fighters. But Awil is not a rebel. He is working for Somalia’s Transitional Federal Government, a critical piece of the American counterterrorism strategy in the Horn of Africa. According to Somali human rights groups and United Nations officials, the Somali government, which relies on assistance from the West to survive, is fielding hundreds of children or more on the front lines, some as young as 9. Child soldiers are deployed across the globe, but according to the United Nations, the Somali government is among the “most persistent violators” of sending children into war, finding itself on a list with notorious rebel groups like the Lord’s Resistance Army. Somali government officials concede that they have not done the proper vetting. Officials also revealed that the United States government was helping pay their soldiers, an arrangement American officials confirmed, raising the possibility that the wages for some of these child combatants may have come from American taxpayers. United Nations officials say they have offered the Somali government specific plans to demobilize the children. But Somalia’s leaders, struggling for years to withstand the insurgents’ advances, have been paralyzed by bitter infighting and are so far unresponsive. According to Unicef, only two countries have not ratified the Convention on the Rights of the Child, which prohibits the use of soldiers younger than 15: the United States and Somalia. Many human rights groups find this unacceptable, and President Obama himself, when this issue was raised during his campaign, did not disagree. “It is embarrassing to find ourselves in the company of Somalia, a lawless land,” he said. All across this lawless land, smooth, hairless faces peek out from behind enormous guns. In blown-out buildings, children chamber bullets twice the size of their fingers. In neighborhoods by the sea, they run checkpoints and face down four-by-four trucks, though they can barely see over the hood. From the release of the US TIP Report yesterday, with child soldiers are listed as a Topic of Special Interest, Somalia is not given a tier ranking for the eighth consecutive year due to a lack of a viable government. 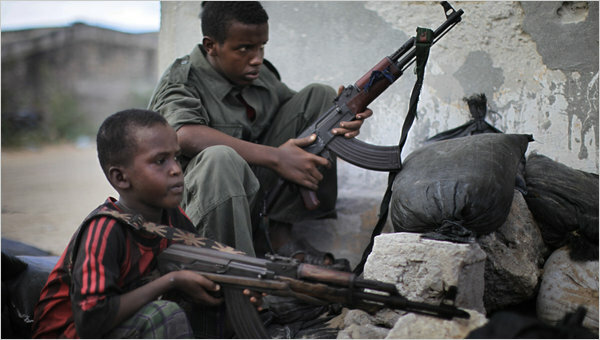 The information on Somalia, however, goes into detail about the different methods by which child soldiers are recruited, kidnapped or forced into supporting militias throughout the country. This article, however, is a reminder that human trafficking, in this case for the purpose of child soldiers, is affected by the wider policy decisions we make concerning security, economics, trade, immigration. It will never be enough to simply say, "We are against slavery," but then ignore the implications of our larger policy decisions. Or to say that it is embarrassing to be in the company of Somalia because the U.S. also has not signed the CRC, but then continue on without ratifying the convention. It will take more than that to put words into action.